Happy Friday! After today, I'm off work for a week! This holiday season snuck up on me! I usually have the majority of our shopping done before Black Friday and have the house decorated the weekend after Thanksgiving. This year I was way behind, but now our home is decorated and the shopping's done so I can relax and enjoy the week with my family and friends! We've been in this home for 10 years and this will be our last Christmas here. We have made so many memories in this home, I made sure I took plenty of photos that we can enjoy looking back at in the years to come. I'm excited to share my home tour with you! Let's start the tour in our den. This is my home office, where our daughter's homework station is set up and it's also used as a cozy reading room. hearts, shoes, presents and a lot of pink! We host an open house for family and friends every Christmas Eve. With all of the baking and cooking, I try to keep my counters open for food prep so most of the decorations are on the windows and above the cabinets. and is set up in the great room, where we spend most of our time. I always love the look of trees that are color coordinated or have a specific theme but ours is filled with a random mix of ornaments that we have collected over the years. 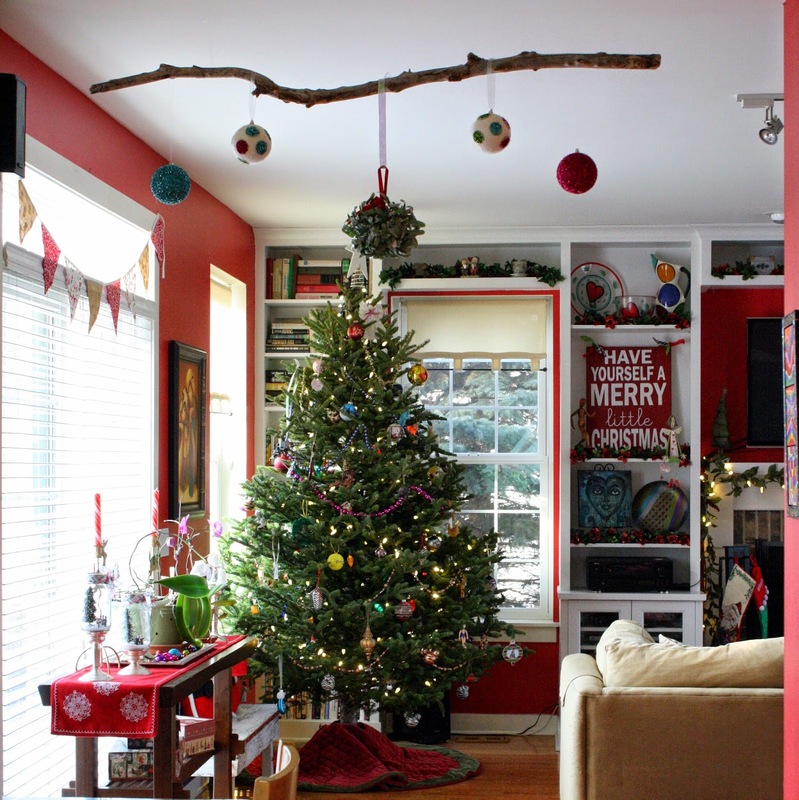 This stick hangs from the ceiling year round. I hang ornaments and mistletoe from it during the holidays, and then photos or banners for birthdays or other occasions. Don't you love how cats just make themselves at home? I just noticed he photo-bombed the photo of our stairway! That's all for now! I hope you enjoyed my home tour! Happy Holidays! It's so festive and pretty, love it! Beautiful home! I especially love that cute small tree in the zinc planter. I always love seeing some behind the scenes. :) Where are you going?! Love it! How festive and quite honestly I like what you did in the bathroom. We have a lot of family coming for Christmas this weekend and I might try to pull something like that together! Beautiful Jill:) Have a Merry Christmas! Your home looks lovely! I hope you have a wonderful Christmas with your family! OMG Jill - are you moving?! When? Where?!? Love all of your holiday decor! You have a beautiful home and do such a great job decorating. I'm not too surprised though considering your knack for crafting!! just GORGEOUS! so glad you shared it with us!! So gorgeous! 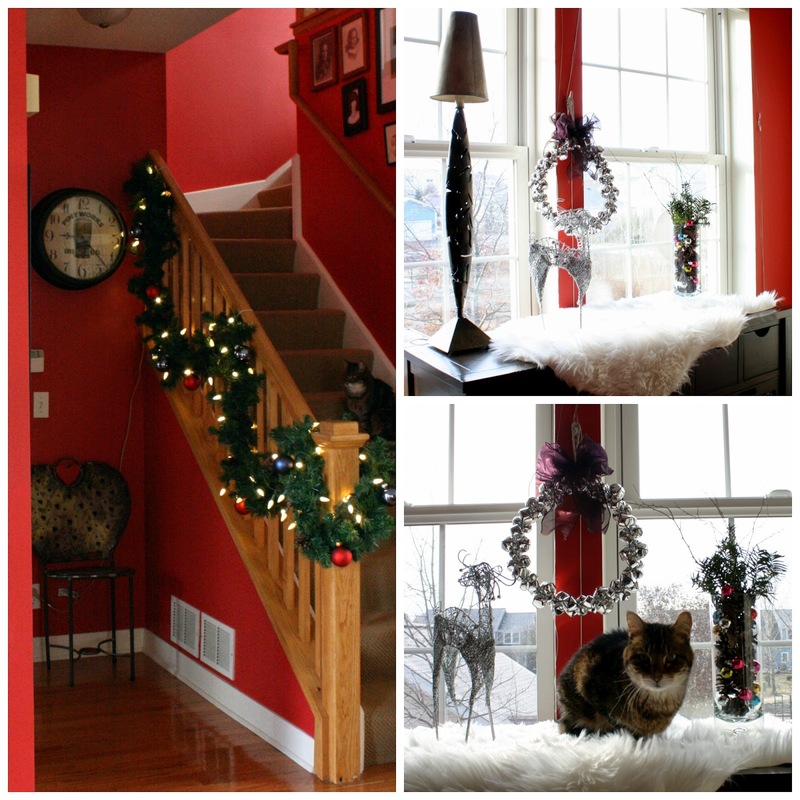 I love all your decor and the red walls-- our kitchen is red too... super festive! I love all of your decor! You have great taste! I love Christmas decorations so much! Your home is gorgeous! You really have captured the spirit of the holiday in your decor! 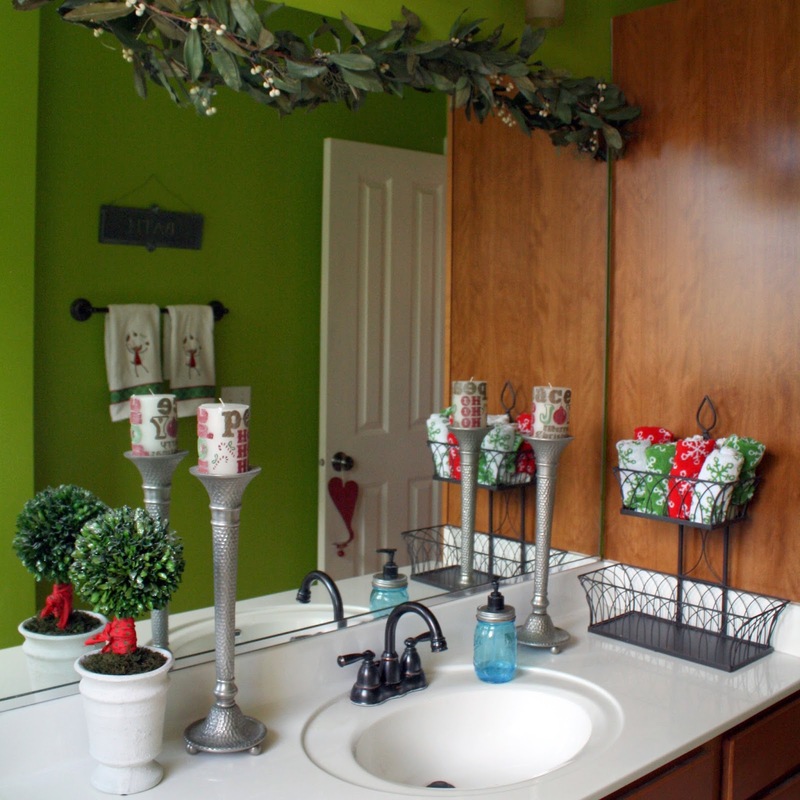 I love all of the gorgeous colors you have used in your home, Jill! Everything looks beautiful and I love all of the festive touches. Thank you so much for inviting us in and sharing! Oh my gosh your house is so cute and perfect!!! Santa would be proud. ;) Seriously all of these pictures should show up on a pinterest holiday feed!! You definitely have a an eye for decorating. You have a beautiful home! 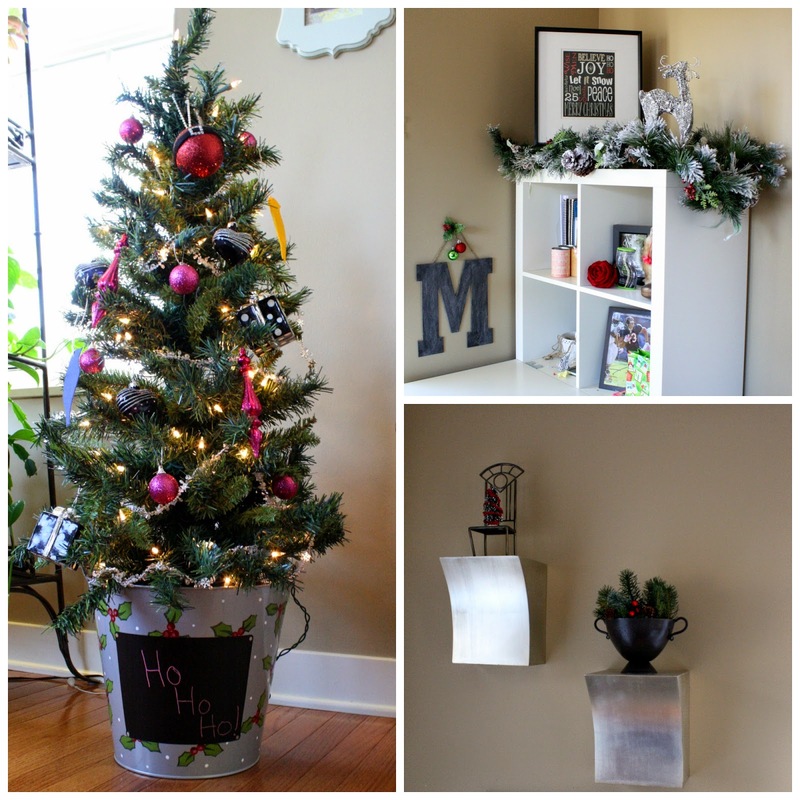 It is so fun to see a glimpse into other bloggers homes and lives. I love how your kitty photo bombed, mine are always out when I am taking photos for the blog. I love the branch you have hanging and also your den, which is used mainly by the girls. 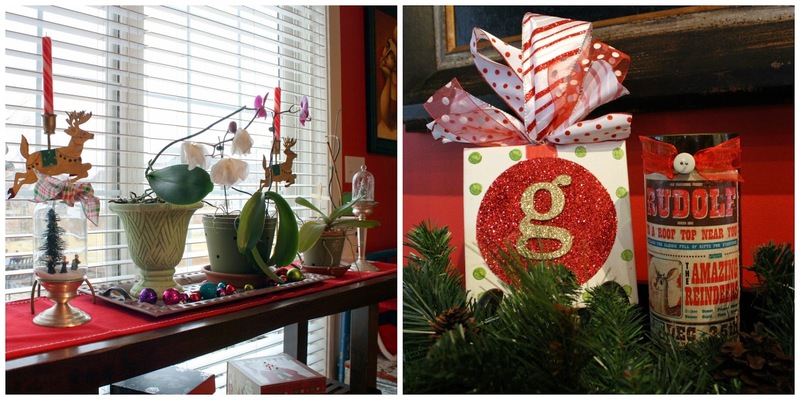 How thoughtful for you to invite family and friends into your home on Christmas Eve! So, so pretty! Your home is lovely and very festive. I love the wreaths on your kitchen cabinets. I may steal that idea next year! Have a wonderful weekend. My fave is the ornaments hanging from that stick and the glitter balls in the glass cover! Your home is adorable! I love all of the Christmas decor!!! Such a pretty home and great decorations! Thanks so much for sharing! Love that! If I ever get our new home organized I'll share too! Thanks Lana! Hope you are having a great weekend! Thank you so much Carrie! 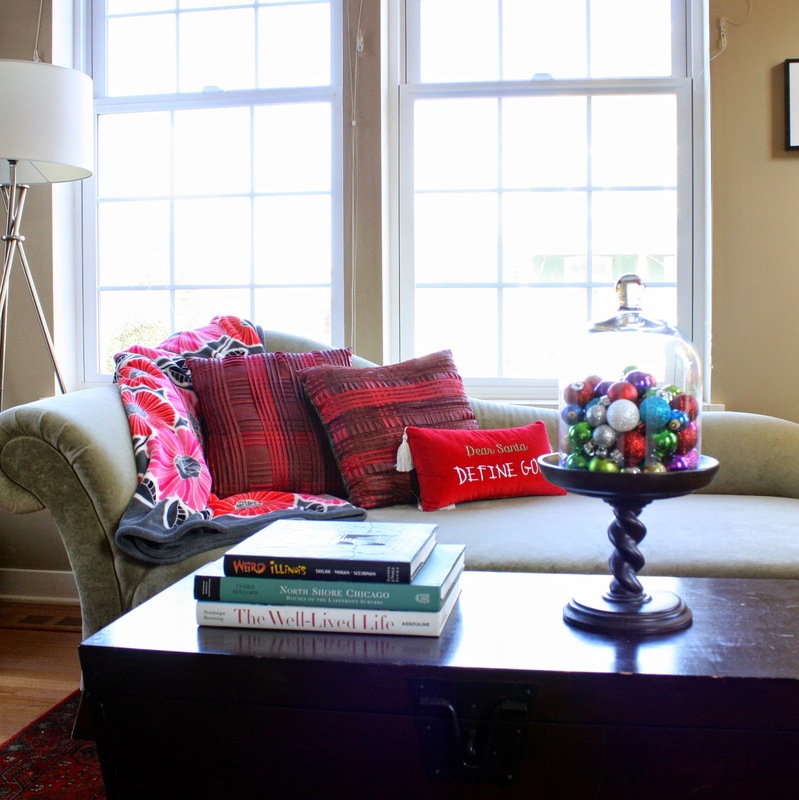 I have really enjoyed seeing all of the blogger home tours also! My husband's Mom always hosted Christmas Eve but now that she is gone, we have taken over the tradition. Hope you are enjoying the weekend! You are so sweet! Thank you Erica! Thank you Megan! So glad you stopped by! Thanks Valerie! I love color on walls! Thank you J! Hope you are having a great weekend! Thank you so much! I try to have a little bit in every room! Thanks Marta! We won't be moving until the end of the school year. Hope you are enjoying the weekend too! Thank you so much Gina! We are staying in the same area, just want to move into a different high school district. We want to time it so we move at the end of the school year. Thank you Blaire! Have a Happy Holiday! Thank you so much Audrey! Merry Christmas! Thank you Amy Ann! We are not going far - just want to change school districts for high school. Thanks Mel! Hope you are enjoying the weekend! Beautiful home Jill! 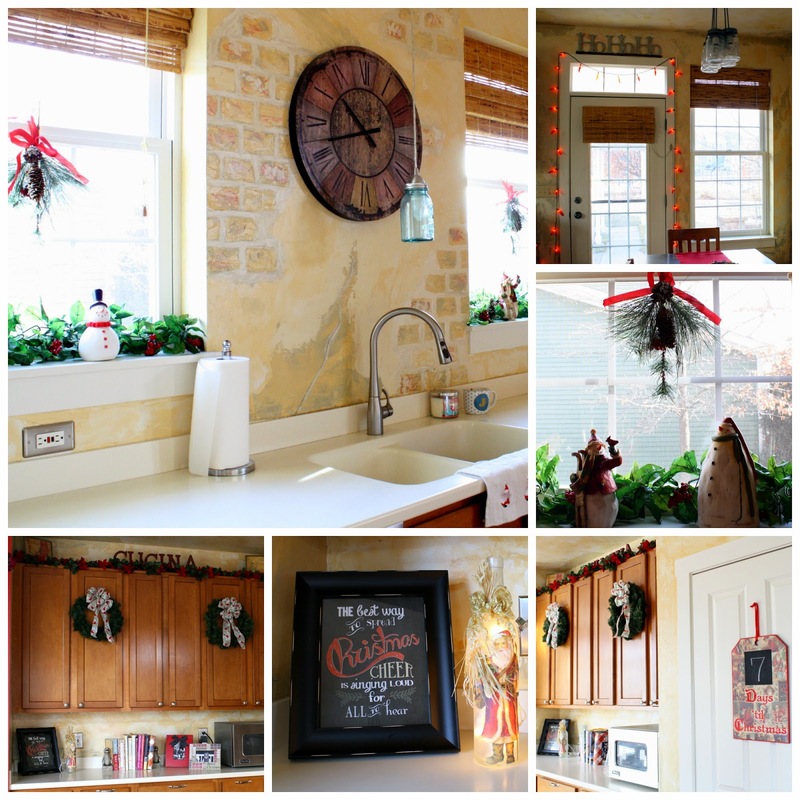 Love your wreaths on the cabinets! Gotta do that next year! Merry Christmas! What a delightful, cozy, festive, beautiful Christmas Home, Jill. 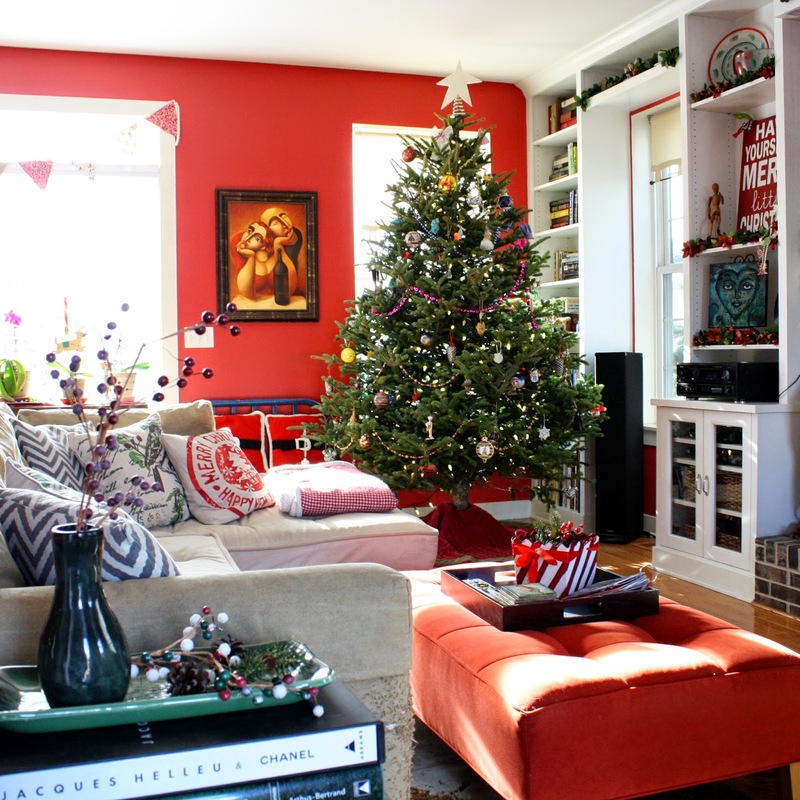 I pinned everything since I love Christmas and gorgeous XMas Homes inspire me so much. It is bittersweet that it will be your final year here. Are you guys changing cities? I love you and your daughter\s feminine, festive place. And your 9 feet tree is gorgeous. I also love themed trees but sometimes trees of everything including many special ornaments come out even more beautiful. 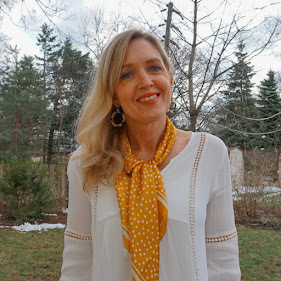 I will be sharing my little decorating tomorrow so come join me and I am co-hosting Watcha Wearing Wednesday, also. Thank you Melanie! Happy Holidays to you! Happy Holidays to You! Thank you for stopping by! Haha! Thank you! That would actually be fun! Then we can go shop for home accessories! Thank you Ada! Hope you enjoy the holidays with your family! Look forward to seeing your decorating post tomorrow! okay, i didn't read all the other comments but your house is pretty much out of a magazine!!!! Maybe next year you can come Christmas-i-fy my house?! Wow, Thank You! I love to decorate and am constantly driving the Hubs crazy with my rearranging things. Wishing you a Merry Christmas! Your house looks fabulous! That stick idea is awesome--what made you think of that?! And are you all moving cities or just moving to a new house closeby? So beautiful!! It's like a show home! You've inspired me to vamp up my Christmas decoration game for next year. 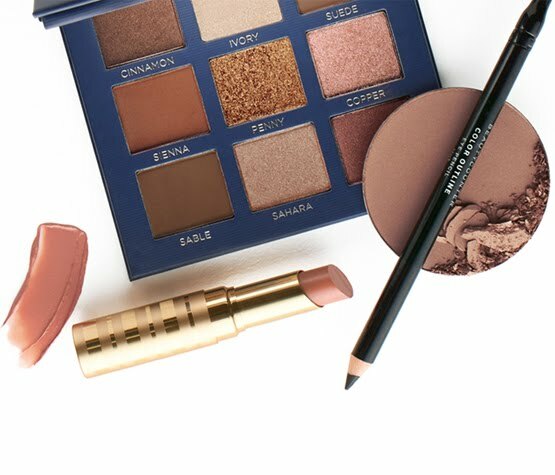 Too too pretty. Thank you so much Heather! I love decorating for the holidays! 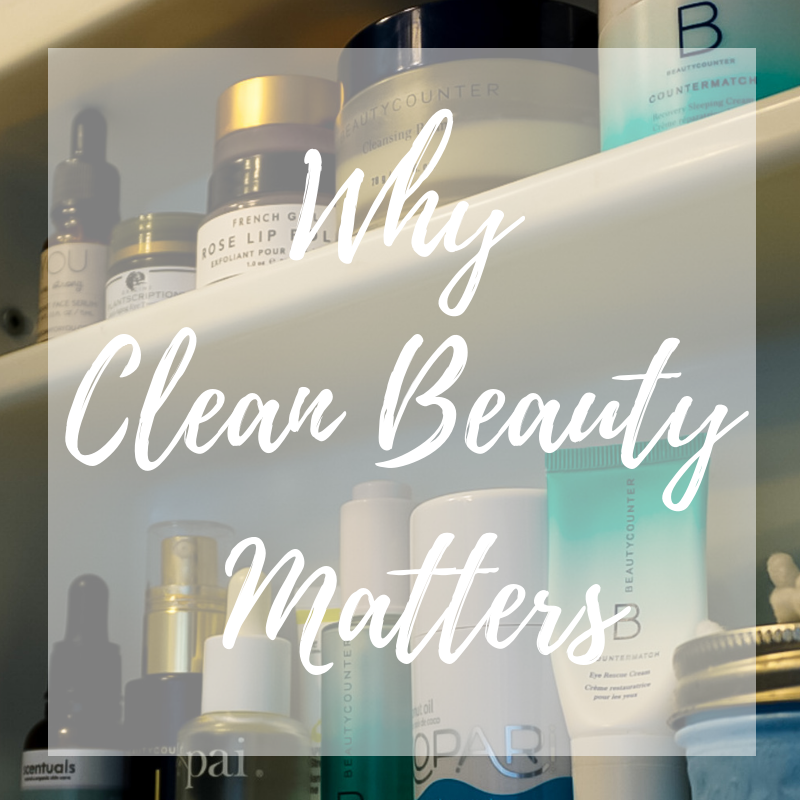 I'm playing catch up on my favorite blogs right now! Your house looks so festive! I love how you put the ornaments under the glass on the coffee table. I know my husband wouldn't let the holiday season go by though without lifting that glass lid and letting the ornaments fall everywhere!! Such a fun idea though! Thank you so much Susan! Wishing you and your family a Happy New Year! You have such a beautiful home! I love that there are splashes of Christmas cheer everywhere!